Working with everyone at Petfinder is an incredible experience. We’re a diverse group of people who are passionate about pets. This month, we wanted to showcase Jamie, our business relations manager. Q: Can you explain what you do as Petfinder’s business relations manager? A: I work closely with Petfinder’s business partners to provide unique value to our users and members. I love working with like minded companies who are passionate about helping homeless pets and making a difference in their lives! I also manage Petfinder’s engagement marketing strategy, working to enhance personalized relationships with all of our wonderful supporters. Q: You adopted your dog, Chloe, from a Petfinder member a few years ago. How has she responded to you working from home? Does she inspire your work? A: Chloe absolutely inspires my work! In fact, she was my inspiration for applying for my position at Petfinder. My husband and I found her on Petfinder four years ago and were the lucky ones to get to adopt her from the amazing K-9 Lifesavers. I was so enamored with her and the Petfinder adoption experience that I kept a close eye on the job listings! Stephen’s first Halloween was food-themed. I’m relatively new to working from home, and it’s been fun and comforting sharing my days with Chloe while I adjust. Although I had imagined catching her in the act of playing with baby toys, she’s pretty much confirmed what I had already witnessed on my “doggie/nanny cam” – napping mixed with watching squirrel TV most of the day! She does greet the UPS delivery guy with enthusiasm (regardless of whether or not I’m on a conference call! ), and even though she really misses her daily visits with her walker, now we both enjoy getting out together for some exercise during lunchtime. Q: You have a darling one-year-old son and wrote a great blog post this spring about how Stephen affected your relationship with Chloe and how Chloe has responded to him. How has their relationship changed as Stephen has grown and learned to do more? A: I think Chloe has finally realized that Stephen is here to stay and has made her peace with it! While she is leery of his unsteady toddling and inclination to try to grab fistfuls of her fur, I get the feeling that she is bemused when he decides it would be more fun to empty her entire toy box and run around with a squeaky bone than it would be to play with any of his own toys–which happens frequently. He is also learning to throw a ball to her, although she has been so good with leaving his toys alone that she’s sometimes hesitant to fully engage in a game of fetch. I’m sure she’ll get the hang of it! She has also grown quite fond of the endless snacks she gets at mealtimes, since Stephen’s favorite game seems to be “uh oh” (also known as “throw food overboard”). Chloe adds so much enrichment for Stephen, “dog” is one of the first words he learned to recognize, and he always points to the dogs in books before any other objects. He squeals with joy each time he comes home and sees Chloe, and took his first steps while trying to reach her! 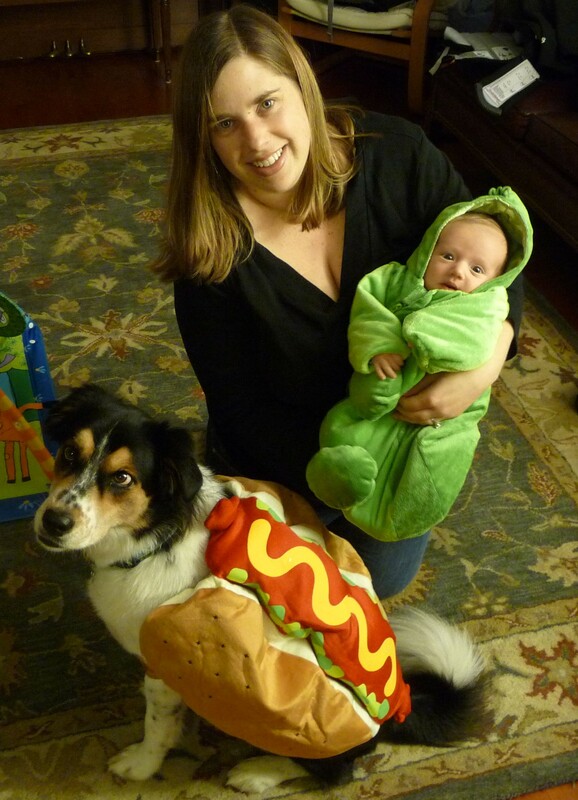 Q: Halloween is coming up and last year we loved seeing your son and Chloe’s food costumes. Did they react at all to seeing the other in costume last year? Will you be dressing them up again this year? A: There was a lot of sniffing last year, but that was about it–Stephen was too young to recognize much at the time. We may have more luck with a reaction this year now that Stephen’s older. There are plans in the works for another theme, let’s just say that our landlubber neighbors best batten down their hatches on trick-or-treat night, arrrrr! Q: Are there any tips on living in harmony with dogs and toddlers that you would like to share with the Petfinder audience? Some dogs love being around babies. Others—not so much. If your dog falls into the latter category, make sure your dog has her own personal space for her to be alone. In a world of baby gates around every corner, it’s easy for your dog to feel trapped and confined with a toddling tornado that will make her feel stressed and unhappy. You want to make sure the time she does spend with your child is as positive as possible. When the positive interactions happen, be sure to reward! Along with praise, I keep dog treats in one pocket, and toddler puffs in the other. I just have to make sure I always give the right treat to the right “kid”. Integrate your dog’s exercise into your toddler’s play routine. A well-exercised dog is also a happy and well-behaved dog, so find ways to include her even if you are working hard to entertain a fussy one-year-old. We often throw balls or play keep away with Chloe’s toys, so that she has the opportunity to run around the house when we are stuck indoors, and I never take a walk or go to the park without bringing along both the stroller and the leash. Teach your child early that your pet is part of the family. When Stephen’s school asked for a family photo to display in his classroom, I was sure to choose one that included Chloe. His teachers tell me that he always points to her first when he looks at the photo, and smiles and laughs. Tell us: Do you have pets and kids? What are your tricks for keeping everyone happy?